Staying on top of one social network is tough enough. Keeping tabs on two, three, or more is nearly impossible if you try doing it the old-fashioned way--by opening a window for each and toggling between them. Who's got time for that? Enter Engagio (www.engag.io), a browser-based service which creates a universal inbox for your messages from popular social networking sites (at this writing, these include 4Square, Disqus, Facebook, Google contacts, Google+, Hacker News, LinkedIn, Tumblr, and Twitter). Engagio's GMail-like interface puts all messages and conversations at your fingertips, flagging each thread with an icon showing which social network it's from. You can reply to messages, share them via e-mail, view them in the originating service, mark them as spam, or--where applicable--like them, all from within Engagio's interface. 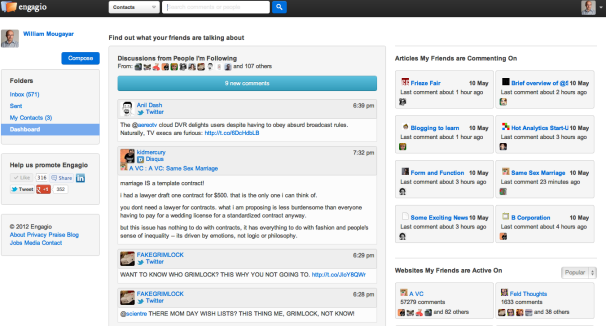 You can also create posts to Facebook, LinkedIn, and Twitter. 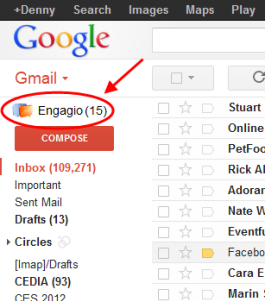 And now, a new Engagio Google Chrome add-on lets you access your Engagio inbox directly from within GMail by clicking on a link that appears atop the list of folders in the left nav bar. In addition to the Chrome add-on, Engagio today also announced a new feature that lets you follow your friends' public conversations across multiple Engagio-supported social networks with a single click. Called the Engagement Discovery Dashboard, this feature allows you to find people to follow either by choosing from your existing Twitter, Facebook and Google contacts, or from Engagio's database of 400,000 profiles drawn from public conversation participants. You can search for people to follow from within the Chrome add-on interface by clicking on a button labeled Discover Friends' Conversations. You don't need anyone's permission to follow them on the Discovery Dashboard because it only shows public conversations that anyone could access--for example, tweets on Twitter's public feed. Engagio simply makes contributions from people who interest you easier to find, while aggregating their posts from multiple services. The Engagio inbox, in contrast, reflects the privacy settings you create in the services you use since it shows private messages. Setting them up in Engagio takes only a few moments. Note, however, that Engagio doesn't show everything you'd see by logging in to Facebook or other services. You don't get Facebook notifications, for example--just direct messages.